Full details of talk and tutorials are available here. 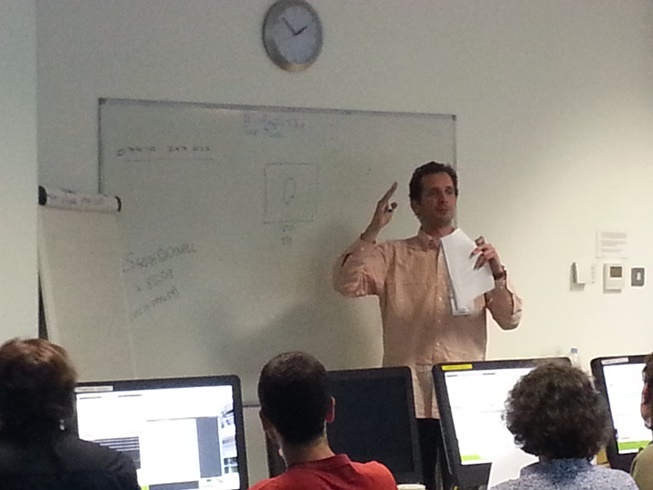 Two one-day workshops introducing the basics of RELION 3 led by developer and structural biologist Rafael Fernandez-Leiro (Spanish National Centre, Madrid) and assisted by Joshua Lobo (eBIC/Diamond) and the CCP-EM team. 18th and 19th February 2019, at Diamond Light Source, UK. University of Michigan cryo-EM workshop, University of Michigan, 16-20 June 2019. Single Particle Cryo-TEM School, Leeds, 10th - 13th Dec 2018. This course provides an introduction to the single particle cryo-TEM pipeline for solving high resolution structures of macromolecular complexes. 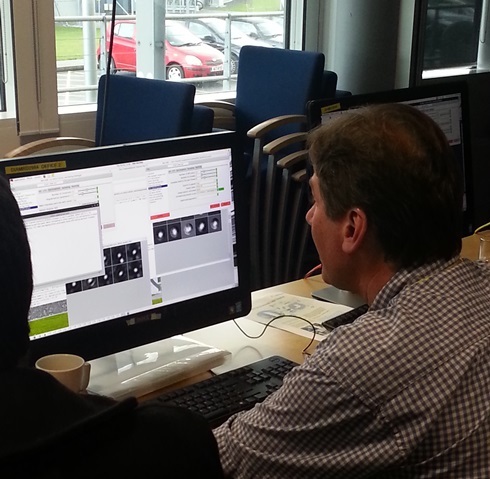 While this is mostly a hands-on practical course, Colin Palmer (CCP-EM) will contribute a lecture on processing. The CCPN annual conference takes place at the University of Kent, 6-8th September 2018. This will includes one day meeting on NMR and EM in collaboration with CCP-EM on the 8th September. We are pleased to announce a one day workshop on Relion 2.1 led by developer and structural biologist Dr Rafael Fernandez-Leiro (Spanish National Cancer Centre, Madrid). It will be hosted by University of Bristol and CCPEM on 18th May 2018 and held in the Linux Computer Lab of the Merchant Venturers Bulding, Bristol BS8 1UB, UK. The workshop will provide hands-on training on all aspects of Relion Image Processing, encompassing all stages of the pipeline, including particle picking, averaging, refinement and classification (see e.g. A pipeline approach to single-particle processing in RELION, R Fernandez-Leiro & S Scheres, doi: 10.1107/S2059798316019276). No previous experience is required, and participants are welcome and encouraged to bring their own data sets. Registration of interest closes on the 30th March and places will be confirmed shortly afterwards. The workshop will provide hands-on training on all practical aspects of subtomogram averaging, encompassing all stages of the pipeline: tomogram visualization and archiving, particle picking techniques for different geometries, averaging, refinement and classification. No previous experience is required, and participants are welcome and encouraged to bring their own data sets. Registration of interest closes on the 11th October and places will be confirmed shortly afterwards. The next EMBO practical course on image processing for cryo-electron microscopy will be held in Birkbeck College, ISMB, London. Further details are available on the course page. This is a pair of workshops aimed at investigating the crossover between emerging EM and MD methods. 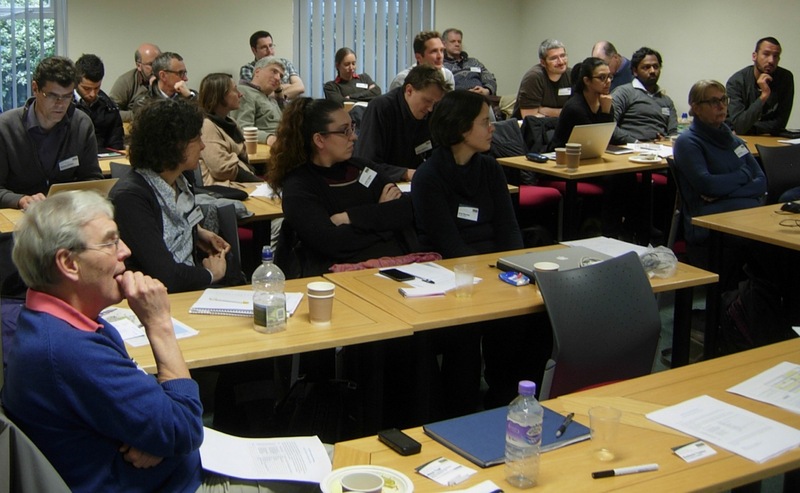 The third Spring Symposium was held again at RAL/DLS, this year in conjunction with the opening of the DLS Electron Bio-Imaging Centre (eBIC). Further details are available on the symposium page. 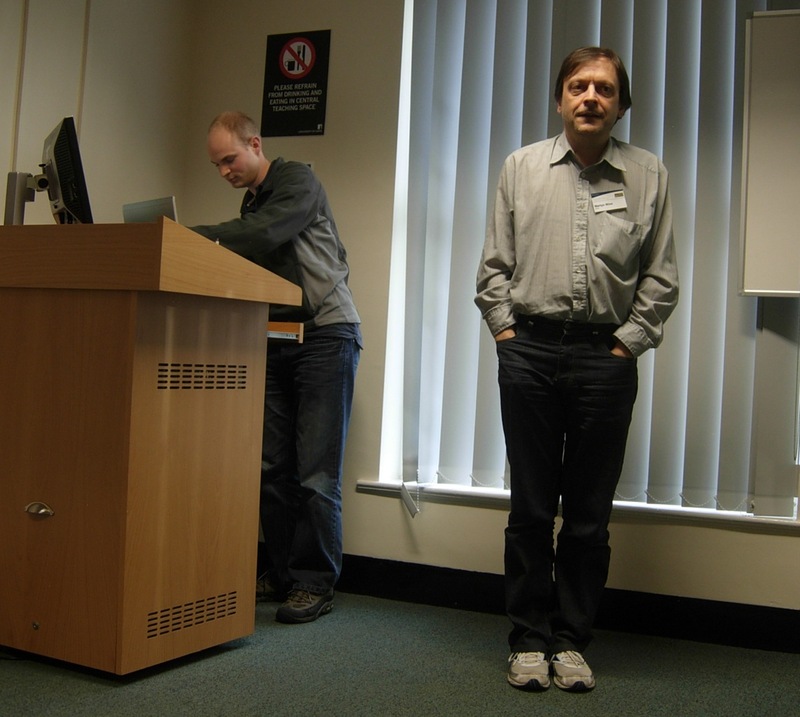 Videos of the talks are available at https://sas.stfc.ac.uk/vportal/ (see "CCPEM Symposium" in left-hand list). This course is for researchers with high resolution EM maps ready for / in the process of modelling building and refinement. This three day course will host some of the leading software developers and provide ample contact time to allow delegates to discuss their data in detail alongside traditional lectures and tutorials. A one day RELION workshop led by its developer Sjors Scheres and hosted by CCP-EM and the Astbury Biostructure Laboratory (University of Leeds, UK) on 19th September 2016. Full details can be found here. Talks from the day are available, and further details of the meeting are on the Biochemical Society events pages. The second CCP-EM Spring Symposium is scheduled for 9-10th May 2016. Registration is now closed and the meeting is full. Further details for delegates will appear here. The course will be held in Madrid, May 17 - 20, 2016. The course will run for four days, from Tuesday morning to Friday lunch, at the CNB-CSIC in Madrid. Tutors will address the complete image processing workflow typical for macromolecular structural determination, from processing the raw images taken on the electron microscope to the interpretation of the derived 3D volumetric structure in terms of atomistic models. We are targeting a maximum of 20 attendees, and we have 10 accommodation grants for students from Instruct countries (https://www.structuralbiology.eu/resources/countries ). This course is aimed at structural biologists with high resolution EM maps ready for / in the process of modelling, building and refinement. This three day course will host some of the leading software developers and provide ample contact time to allow delegates to discuss their data in detail alongside traditional lectures and tutorials. 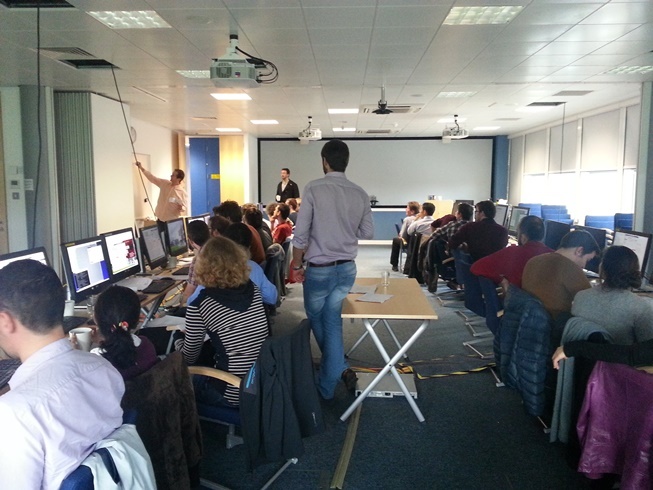 The course will be held at the RAL / Diamond campus, Harwell, UK on 2nd - 4th March 2016. Talks and tutorials will be made available. 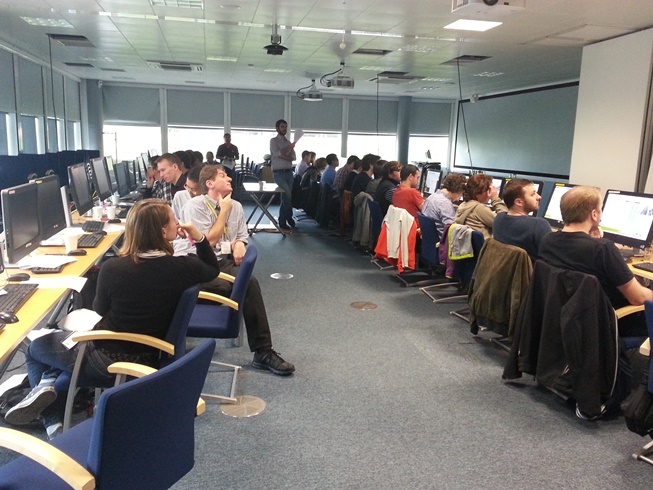 CCP-EM hosted a 3-day workshop on the Dynamo software, 14th - 16th Dec 2015 on the Harwell campus, UK. The tutors were Daniel Castano-Diez, Misha Kudryashev, Sai Li and Juha Huiskonen. Further details are available on the course page. CCP-EM are proud to announce the inaugural 'CCP-EM Spring Symposium'. This two day conference was held at the site of the new National UK Electron Bio-Imaging Facility on the Harwell Campus, Oxfordshire on the 28-29th May 2015. The theme of the conference is a celebration of the upcoming facility, the initial alpha release of the CCP-EM software suite, as well as the exciting developments in electron microscopy and tomography. Further details are available on the conference page. Working Group 2 of CCP-EM are planning a short workshop on the computational issues of running an EM lab, which will take place at the end of the Spring Symposium. The workshop will cover hardware requirements, software infrastructure, and logistics. As part of the planning, there is a survey on computational needs, which we'd like as many people (at all levels) to fill out. This Instruct/CCPEM/CCP4 course was aimed at both electron microscopists wishing to interpret their volume models, and scientists from MX/NMR looking to understand the increasing amount of cryoEM data available. The tools covered included Chimera, DockEM, ShapEM, FlexEM, Refmac, Coot, SMaSB/PDBeShape, and tools from the EM Data Bank. Course material is available on a separate page. 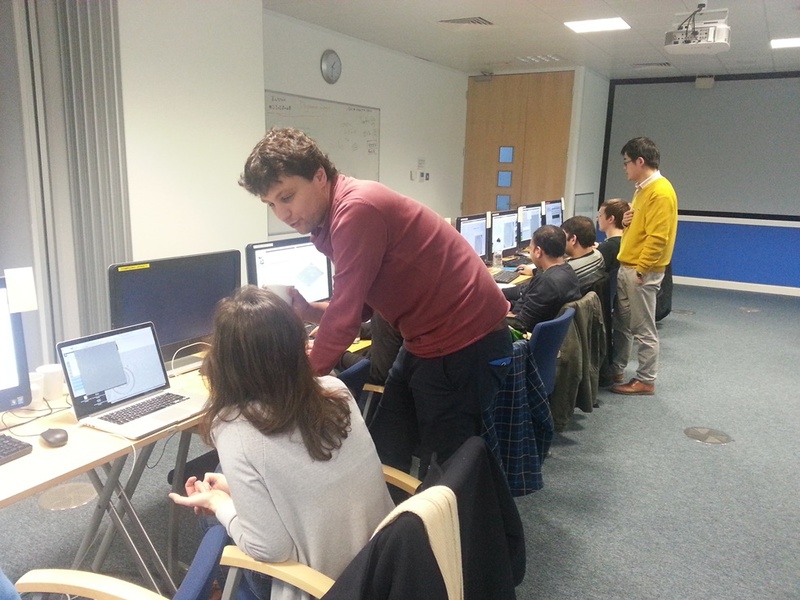 The first one-day training course on Relion was practical course on image processing for cryo-electron microscopy held at Diamond Light Source on Thursday 16th October 2014. 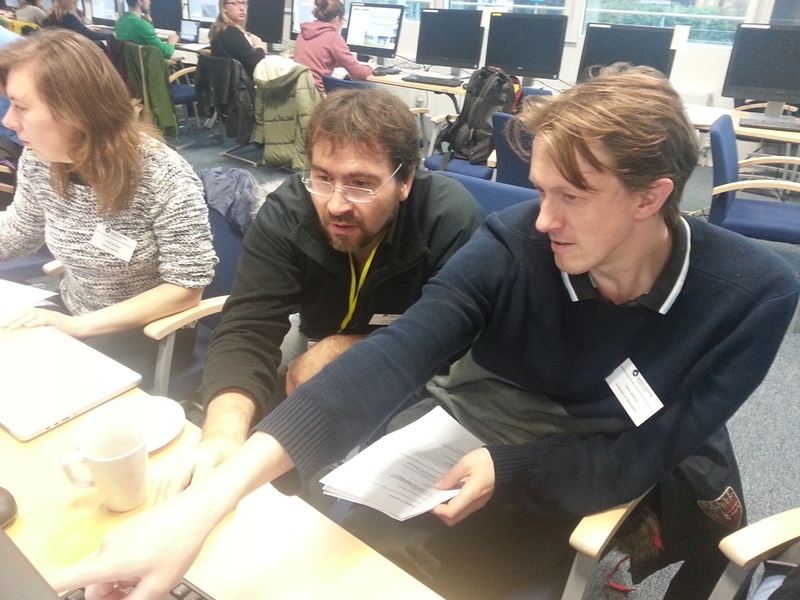 It focussed on both theoretical and practical aspects of the RELION software package and was led by the principle developer Dr Sjors Scheres (MRC-LMB), with help from Felix Weis (MRC-LMB) and the local CCP-EM team. A repeat of this course was held on 8th December 2014. We hope to run this course a third time in 2015. An introduction to regularised likelihood and Relion can be found in lecture 6 of the recent MRC-LMB course on EM. Our first public event was a 1-day discussion workshop to get community input into what CCP-EM does, and gather requirements. 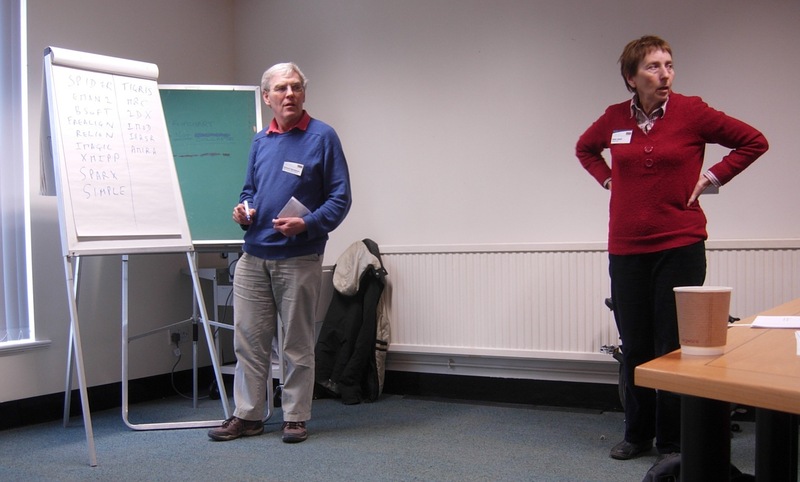 Neil Ranson and Arwen Pearson kindly agreed to host the meeting at Leeds, on the Thursday 7th February 2013.